**Pink vinyl housed in thick, clear poly sleeve. 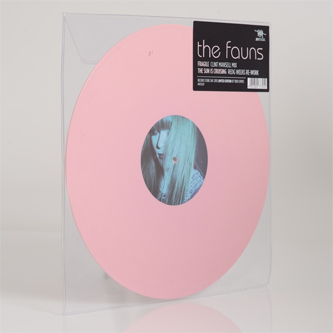 RSD exclusive edition of 1000 copies** Geoff Barrow's Invada imprint invite Clint Mansell and Redg Weeks to indulge their shoegaze passions on a fine pair of remixes for Bristolian group, The Fauns. We catch revered indie-pop and soundtrack composer Clint Mansell mixing Alison Garner's breathy vocals deep in a cloud of fuzzed up 'gazers guitars and propulsive drums, all made to be loud. Redg Weeks' take on The Sun Is Cruising' is quite different, placing Alison's vocals delicately with chamber-like reverbs against a tender backdrop of tidal white noise rising to a motorik sway and creamy, keening distorto harmonics.